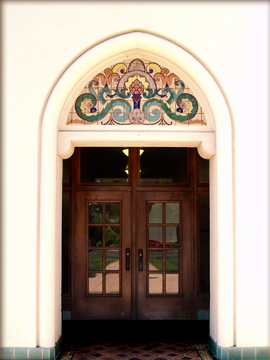 Please be advised that completing and returning an application to rent Historic Hoover Theatre does not constitute a confirmed hold on your date. A hold is confirmed at the time a fully executed Lease Agreement and Facility Rental Deposit have been received by Domus Aurea Facility Management. 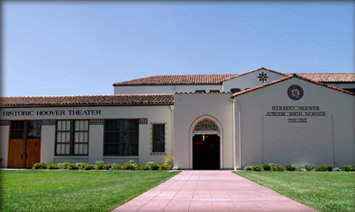 In addition to the 198 seat theatre, there are three studios, a kitchen/greenroom, the courtyard, and one dance studio available for rent. The floor of Studio A is carpeted and the room is equipped with a whiteboard and markers. 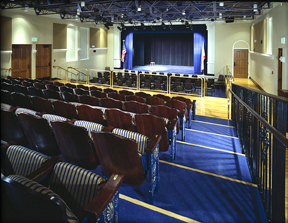 Studio A can accommodate 40 people conference style or 50 people theatre style. The movable acoustic wall between Studio A and B can be opened to create a 50’ X 22’ workspace. The floor of Studio B is also carpeted and the room is equipped with a whiteboard and markers. 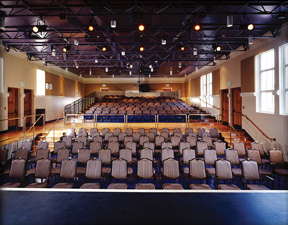 Studio B can accommodate 36 people conference style or 40 people theatre style. The floor of Studio C is vinyl tile and the room is equipped with a whiteboard and markers. 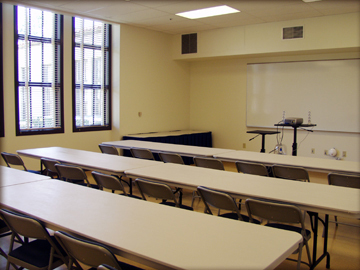 This room is generally used for theatre rehearsals and auditions, but can accommodate 40 people conference style or 50 people theatre style. The walls of the Dance Studio are mirrored on three sides and the flooring is vinyl tiles. A Yamaha U-3 upright is available for use in the room, as are 4 sets of ballet bars, if requested. The Green Room, located just of the courtyard area, is equipped with two sinks, a small refrigerator, microwave and icemaker. The flooring is vinyl tiling and can host a reception for up to 50 people or sit-down lunch for 40. 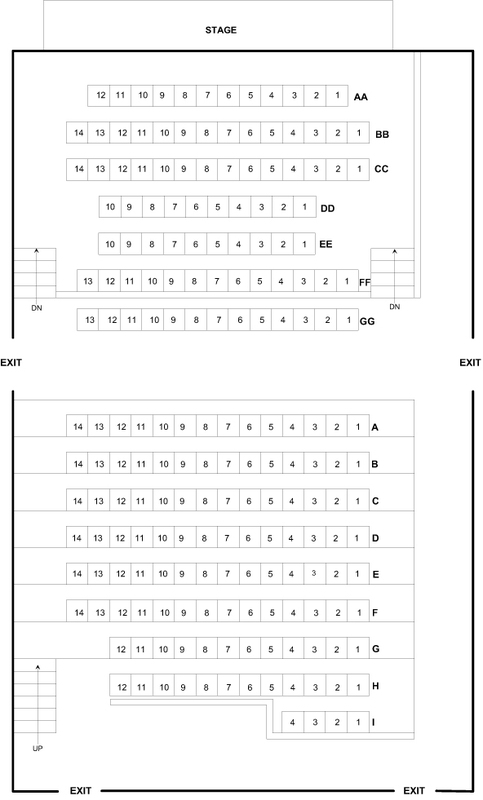 The Courtyard – Dimensions available upon request. 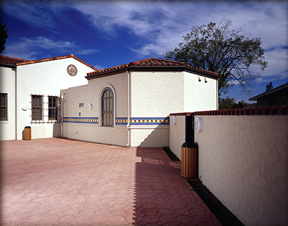 The Courtyard is a quiet, privately walled area located just adjacent to the Theatre and the Green Room. Nicely lit in the evenings, with concrete tile flooring, the Courtyard is a perfect area for receptions, accomodating up to 150 people.